Clyde’s opening league game under Jim Chapman ended in defeat as two late goals gave Berwick a 3-1 win at Shielfield Park on Saturday. Clyde looked on course to begin the campaign with a victory after going in front - but paid the price for not taking their chances. 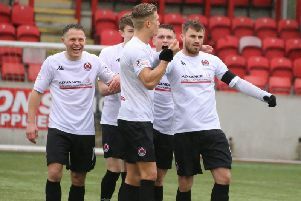 The opener came in 23 minutes when David Goodwillie rode two challenges as he cut in from the left and fired past home goalkeeper Robby McCrorie from an acute angle. A minute later he might have made it two, but this time McCrorie rushed off his line and blocked his close range effort. Berwick seldom threatened the Clyde goal, but just before the half-time whistle, in the 45th minute, Aaron Murrell slipped the ball through to Andy Irving and the 17-year-old drilled in a low left foot shot into the bottom corner to make it 1-1 at the break. In the second half Clyde continued to threaten and McCrorie, who was named ‘Man of the Match,’ made several saves to keep his side in the game. Goodwillie also went close when he raced through and lifted the ball onto the roof of the net. Rangers didn’t look like scoring, but on 83 minutes an Irving free-kick from the edge of the box came back off a post and Murrell prodded home the rebound from close range. Then, in 89 minutes, Irving made the game safe with his second of the game, finding the net with a shot from just inside the box. Clyde boss Jim Chapman said: “There is a reason we lost today, and that’s because we didn’t take our chances and Berwick did. “Berwick only had three shots at goal and scored with all three of them.